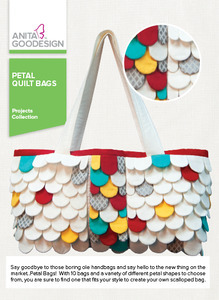 This is an entirely new concept for Anita Goodesign, our first petal quilt. The concept is actually very simple. You stitch the individual petals first using the fabric of your choice. Then you simply attach them using our included pattern onto quilt backgrounds. Once the quilt blocks are finished, you can use them as you would any other quilt block, or create a unique bag like we did. There are 10 different types of petals and bag patterns. You will not be able to make just one! 10 different bags (60 different designs total) in 2 sizes. Hoop sizes range from 6” x 10” to 8”x 12”.